In a bid to share safer operating practices with other businesses, FORS Gold Operator, O’Donovan Waste Disposal, has launched a campaign for 2016 to help raise awareness of a range of safety themes when driving for work. The waste operator has planned a series of topics which will be distributed via social media, email and flyers, to help share best practice not only amongst its own employees, but also with its clients and peers. The ninth annual Barrow-upon-Soar to Skegness Bike Ride will take place on Saturday 4 June, 2016. 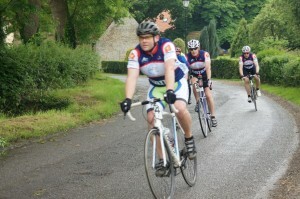 The ride is organised by volunteers from British Gypsum, the UK’s leading manufacturer and distributor of plaster and plasterboard, and supported by its FORS accredited haulage partners, DHL and CEVA Logistics. FORS accredited operators are reminded to make full use of The Chartered Institute of Logistics and Transport’s (CILT’s) International Knowledge Centre. The award winning International Knowledge Centre is a benefit for all FORS accredited operators and provides unrivalled access to over 48,000 publications, 7,000 journals, 10,000 global company reports and a world newspaper database of over 2,000 global newspapers and magazines. CLOCS (Construction Logistics and Cyclist Safety) held its fifth conference and exhibition at London’s ExCel on Wednesday 23 March 2016. CLOCS has been instrumental in bringing about a visionary change in the way the construction industry manages work related road risk whilst providing an opportunity for clients and developers to look out for the wider community. This is being achieved by; improving the safety of vehicles; addressing the imbalance between on-site health and safety and work related road safety; and encouraging wider adoption of best practice across the logistics industry. The CLOCS Standard for construction logistics: Managing work related road risk has been developed as a common national standard for use by the construction logistics industry. Implemented by construction clients through contracts, it provides a framework that enables ownership in managing road risk which can be adhered to in a consistent way by fleet operators. Featuring a line-up of high profile speakers the conference reviewed the progress and success of the CLOCS programme, now in its third year. The exhibition showcased 29 new and existing enhanced vision truck designs from HGV manufacturers and operators including FORS members Tarmac, Ringway Jacobs, Cemex, O’Donovan, Powerday, Erith Haulage, FM Conway, Travis Perkins, Martin Brower, Hanson and SIG. 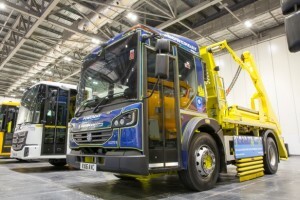 The vehicles on show included the Volvo low entry cab, Scania’s new low-height, high-vision 8×2*6 Urban Tipper, Dennis Eagle’s Elite 6 skip loader, DAF’s Euro-6 LF 250 FA skip loader and the Mercedes Benz Econic 4×2 skip loader 1830L.